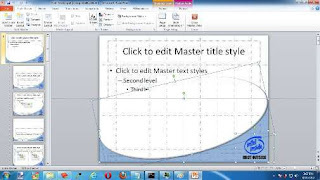 Master slide on ppt (powerpoint) can be useful to your presentation because from only one slide other will follow. It is very helpful from wasting time to creating slide, so it's more efisien. how to create it, follow this step. 3. Creating your own slide master here. But before you're creating a master slide powerpoint, you should have plan what will you create in it. I suggest you creating from shapes, it really simple, just arrange it to make your own background. After you're creating master slide, back to home and begin to create your powerpoint content. you just add slide or duplicate slide it will same to master slide. slide master also very helpful to make a mark to your presentation so anybody can't copy it. It's really simple isn't it? if you little confused because my english grammar is not right, just watch this video and i also give you sample so you can learn below it.